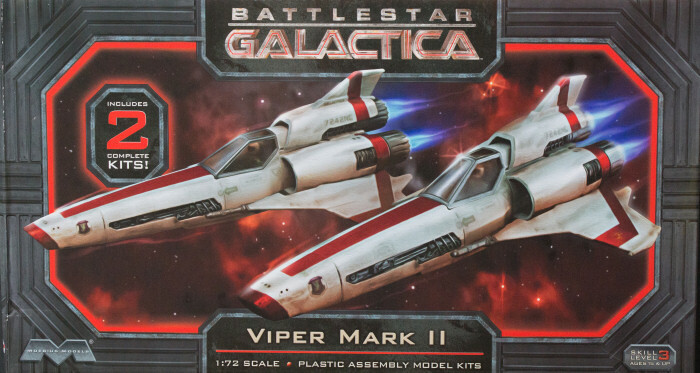 A few years ago, Moebius Models began releasing kits from the second Battlestar Galactica (2004) series and have several new subjects coming that have never been produced in kit form before. One of the subjects previously released was the Viper Mark II fighter which was considered an antique at the beginning of the series as it was almost completely replaced by the Viper Mark VII before the Cylon attack on the colonies. Even so, the Mark II looks more 'modern' than the Viper Mark I that was the principal fighter of the original Battlestar Galactica (1978) series. Moebius released the Mark II and Mark VII in 1/32 scale and even followed up with a new-tool Mark I to offset the old Revell kit. Moebius is back with the Mark II in 1/72 scale, a sign perhaps that we'll be seeing other Battlestar Galactica subjects in this scale as well? Assembly of the kit is very straightforward with excellent instructions to show the almost snap-together process of assembly. The instructions also provide clear painting and decal placement diagrams as well. The markings not only provide extensive markings for both Vipers, they also include squadron patches for the pilots as well. This is yet another nice kit from Moebius Models that provide two nice Vipers to display together or one for your shelf and one for your desk. Give one a try!